Arctic climate variability for the last 2 millennia has been investigated using statistical and signal analyses from North Atlantic, Siberia and Alaska regionally averaged records. A focus on the last 2 centuries shows a climate variability linked to anthropogenic forcing but also a multidecadal variability likely due to regional natural processes acting on the internal climate system. It is an important issue to understand multidecadal variabilities occurring in the instrumental data. The last glacial period was punctuated by abrupt climatic variations, whose cold atmospheric phases have been commonly associated with cold sea-surface temperatures and expansion of sea ice in the North Atlantic and adjacent seas. Here we provide direct evidence of a regional paradoxical see-saw pattern: cold Greenland and North Atlantic phases coincide with warmer sea-surface conditions and shorter seasonal sea-ice cover durations in the Norwegian Sea as compared to warm phases. This paper presents new analyses conducted at high resolution in the Gulf of Cadiz over the last 50 ky. Palaeohydrological changes in these subtropical latitudes are discussed through dinoflagellate cyst assemblages but also dinocyst transfer function results, implying sea surface temperature and salinity as well as annual productivity reconstructions. This study is thus important for our understanding of past and future productivity regimes, also implying consequences on the biological pump. The present study is related the climate changes and their environmental impacts during the last 6 ky from a fossil record collected in the Middle Atlas, Morocco. We used the reconstruction of three climate variables and geo-chemical elements to evaluate the relationships between all the environmental variables. In summary, this present study confirms the overall climate stability over the last 6 ky and highlights the presence of a short and abrupt climate event at about 5.2 ka cal BP. We explore the hypothesis that a shift in global climate 4200 years ago (the 4.2 ka event) was related to the El Niño–Southern Oscillation (ENSO). 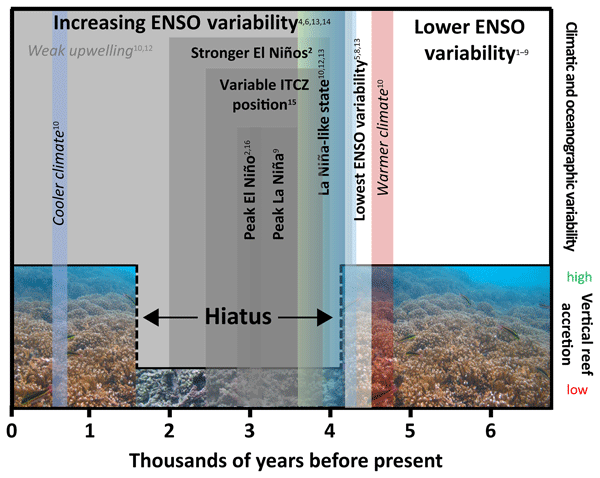 We summarize records of coral reef development in the tropical eastern Pacific, where intensification of ENSO stalled reef growth for 2500 years starting around 4.2 ka. Because corals are highly sensitive to climatic changes, like ENSO, we suggest that records from coral reefs may provide important clues about the role of ENSO in the 4.2 ka event. A foraminifer oxygen isotope record from the northeastern Arabian Sea was used to reconstruct winter and summer monsoon strength from 5.4 to 3.0 ka. 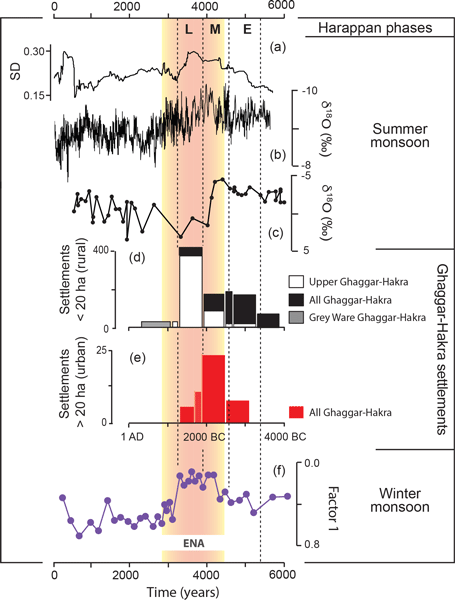 We found a 200-year period of strengthened winter monsoon (4.5–4.3 ka) that coincides with the earliest phase of the Mature Harappan period of the Indus Civilization, followed by weakened winter and summer monsoons by 4.1 ka. Aridity spanning both rainfall seasons at 4.1 ka may help to explain some of the observed archaeological shifts. Climate reorganization during the early neoglacial anomaly (ENA) may explain the Harappan civilization metamorphosis from an urban, expansive culture to a rural, geographically-confined one. Landcover change is a candidate for causing this climate instability. During ENA agriculture along the flood-deficient floodplains of the Indus became too risky, which pushed people out. In the same time the Himalayan piedmont received augmented winter rain and steady summer precipitation, pulling people in. Multi-proxy analyses (i.a., benthic foraminiferal assemblages and sedimentary properties) of a marine record from Woodfjorden at the northern Svalbard margin (Norwegian Arctic) illustrate a significant contribution of relatively warm Atlantic water to the destabilization of tidewater glaciers, especially during the deglaciation and early Holocene (until ~ 7800 years ago), whereas its influence on glacier activity has been fading during the last 2 millennia, enabling glacier readvances. Based on mineral records from the northern Chukchi Sea, we report a long-term decline in the Beaufort Gyre (BG) strength during the Holocene, consistent with a decrease in summer insolation. Multi-centennial variability in BG circulation is consistent with fluctuations in solar irradiance. The Bering Strait inflow shows intensification during the middle Holocene, associated with sea-ice retreat and an increase in marine production in the Chukchi Sea, which is attributed to a weaker Aleutian Low. The Arctic and Pacific oceans are connected by the presently ~53 m deep Bering Strait. During the last glacial period when the sea level was lower than today, the Bering Strait was exposed. Humans and animals could then migrate between Asia and North America across the formed land bridge. From analyses of sediment cores and geophysical mapping data from Herald Canyon north of the Bering Strait, we show that the land bridge was flooded about 11 000 years ago. Our study demonstrates that a source to sink analysis in the Gouritz catchment can be used to obtain valuable paleoclimatic information form the year-round rainfall zone. In combination with SST reconstructions these data are a valuable contribution to the discussion of Southern Hemisphere palaeoenvironments and climate variability (in particular atmosphere–ocean circulation and hydroclimate change) in the South African Holocene. We reconstruct changes in the warm water transport from the subtropical to the subpolar North Atlantic over the last 10 000 years. We use stable isotope and Mg / Ca ratios measured on surface and subsurface dwelling foraminifera. Results indicate an overall stable warm water transport at surface. The northward transport at subsurface evolves stepwise and stabilizes at 7 ka BP on the modern mode. These ocean transport changes seem to be controlled by the meltwater inflow into the North Atlantic. We present a high-resolution multi-proxy study about the evolution of sea surface conditions along the last 2700 yr in the north-western Mediterranean Sea based on five sediment records from two different sites north of Minorca. The novelty of the results and the followed approach, constructing stack records from the studied proxies to preserve the most robust patterns, provides a special value to the study. This complex period appears to have significant regional changes in the climatic signal. A sediment core collected from a pockmark field on the Vestnesa Ridge (~80N) in the Fram Strait is presented. Our results show an undisturbed sedimentary record for the last 14 ka BP and negative carbon isotope excursions (CIEs) during the Bølling-Allerød interstadials and during the early Holocene. Both CIEs relate to periods of ocean warming, sea-level rise and increased concentrations of methane (CH4) in the atmosphere, suggesting an apparent correlation with warm climatic events. Storfjordrenna was deglaciated about 13,950 cal yr BP. During the transition from the sub-glacial to glaciomarine setting, Arctic Waters dominated its hydrography. However, the waters were not uniformly cold and experienced several warmer spells. Atlantic Water began to flow onto the shelves off Svalbard and into Storfjorden during the early Holocene, leading to progressive warming and significant glacial melting. A surface-water cooling and freshening occurred in late Holocene. Abrantes, F., Rodrigues, T., Montanari, B., Santos, C., Witt, L., Lopes, C., and Voelker, A. H. L.: Climate of the last millennium at the southern pole of the North Atlantic Oscillation: An inner-shelf sediment record of flooding and upwelling, Clim. Res., 48, 261–280, 2011. Andrews, J. T. and Giraudeau, J.: Multi-proxy records showing significant Holocene environmental variability: the inner N. Iceland shelf (Hunafloi), Quaternary Sci. Rev., 22, 175–193, 2003. Ba, J., Keenlyside, N. S., Latif, M., Park, W., Ding, H., Lohmann, K., Mignot, J., Menary, M., Otterå, O. H., Wouters, B., Salas y Melia, D., Oka, A., Bellucci, A., and Volodin, E.: A multi-model comparison of Atlantic multidecadal variability, Clim. Dynam., 43, 2333–2348, 2014. Berner, K. S., Koç, N., Divine, D., Godtliebsen, F., and Moros, M.: A decadal-scale Holo-cene sea surface temperature record from the subpolar North Atlantic constructed using diatoms and statistics and its relation to other climate parameters, Paleoceanography, 23, PA2210, https://doi.org/10.1029/2006PA001339, 2008. Bianchi, G. G. and McCave, I. N.: Holocene periodicity in North Atlantic climate and deep-ocean flow south of Iceland, Nature, 397, 515–517, 1999. Bingham, R. J., Hughes, C. W., Roussenov, V., and Williams R. G.: Meridional coherence of the North Atlantic meridional overturning circulation, Geophys. Res. Lett., 34, L23606, https://doi.org/10.1029/2007GL031731, 2007. Blaauw, M.: Methods and code for “classical” age-modelling of radiocarbon sequences, Quat. Geochronol., 5, 512–518, 2010. Bond, G., Kromer, B., Beer, J., Muscheler, R., Evans, M. N., Showers, W., Hoffmann, S., Lotti-Bond, R., Hajdas, I., and Bonani, G.: Persistent solar influence on North Atlantic climate during the Holocene, Science, 294, 2130–2136, 2001. Brocheray, S., Cremer, M., Zaragosi, S., Schmidt, S., Eynaud, F., Rossignol L., and Gillet, H.: 2000 years of frequent turbidite activity in the Capbreton Canyon (Bay of Biscay), Mar. Geol., 347, 136–152, https://doi.org/10.1016/j.margeo.2013.11.009, 2014. Bryden, H. L., Longworth, H. R., and Cunningham, S. A.: Slowing of the Atlantic meridional overturning circulation at 25° N, Nature, 438, 655–657, 2005. Chabaud, L., Sanchez Goni, M. F., Desprat, S., and Rossignol, L.: Land-sea climatic variability in the eastern North Atlantic subtropical region over the last 14,200 years: Atmospheric and oceanic processes at different timescales, Holocene, 24, 787–797, 2014. Charria, G., Lazure, P., Le Cann, B., Serpette, A., Reverdin, G., Louazel, S., Batifoulier, F., Dumas, F., Pichon, A., and Morel, Y.: Surface layer circulation derived from Lagrangian drifters in the Bay of Biscay, J. Marine Syst., 109–110, S60–S76, https://doi.org/10.1016/j.jmarsys.2011.09.015, 2013. Cisneros, M., Cacho, I., Frigola, J., Canals, M., Masqué, P., Martrat, B., Casado, M., Grimalt, J. O., Pena, L. D., Margaritelli, G., and Lirer, F.: Sea surface temperature variability in the central-western Mediterranean Sea during the last 2700 years: a multi-proxy and multi-record approach, Clim. Past, 12, 849–869, https://doi.org/10.5194/cp-12-849-2016, 2016. Clark, P. U., Pisias, N. G., Stocker, T. F., and Weaver, A. J.: The role of the thermohaline circulation in abrupt climate change, Nature, 415, 863–869, 2002. Copard, K., Colin, C., Henderson, G. M., Scholten, J., Douville, E., Sicre, M.-A., and Frank, N.: Late Holocene intermediate water variability in the northeastern Atlantic as recorded by deep-sea corals, Earth Planet. Sc. Lett., 313–314, 34–44, https://doi.org/10.1016/j.epsl.2011.09.047, 2012. Colin, C., Frank, N., Copard, K., and Douville, E.: Neodymium isotopic composition of deep-sea corals from the NE Atlantic: implications for past hydrological changes during the Holocene, Quaternary Sci. Rev., 29, 2509–2517, https://doi.org/10.1016/j.quascirev.2010.05.012, 2010. Dawson, A., Elliott, L., Noone, S., Hickey, K., Holt, T., Wadhams, P., and Foster, I.: Historical storminess and climate “see-saws” in the North Atlantic region, Mar. Geol., 210, 247–259, 2004. Debret, M., Bout-Roumazeilles, V., Grousset, F., Desmet, M., McManus, J. F., Massei, N., Sebag, D., Petit, J.-R., Copard, Y., and Trentesaux, A.: The origin of the 1500-year climate cycles in Holocene North-Atlantic records, Clim. Past, 3, 569–575, https://doi.org/10.5194/cp-3-569-2007, 2007.
deCastro, M., Gómez-Gesteira, M., Alvarez, I., and Gesteira, J. L. G.: Present warming within the context of cooling–warming cycles observed since 1854 in the Bay of Biscay, Cont. Shelf Res., 29, 1053–1059, https://doi.org/10.1016/j.csr.2008.11.016, 2009. Desprat, S., Sánchez-Goñi, M. F., and Loutre, M.-F.: Revealing climatic variability of the last three millennia in northwestern Iberia using pollen influx data, Earth Planet. Sc. Lett., 213, 63–78, 2003. Esnaola, G., Sáenz, J., Zorita, E., Fontán, A., Valencia, V., and Lazure, P.: Daily scale wintertime sea surface temperature and IPC-Navidad variability in the southern Bay of Biscay from 1981 to 2010, Ocean Sci., 9, 655–679, https://doi.org/10.5194/os-9-655-2013, 2013. Eynaud, F., Turon, J. L., and Duprat, J.: Comparison of the Holocene and Eemian palaeoenvironments in the South Icelandic Basin: Dinoflagellate cysts as proxies for the North Atlantic surface circulation, Rev. Palaeobot. Palyno., 128, 55–79, 2004. Eynaud, F., Rossignol, L., and Gasparotto, M.-C.: Planktic foraminifera throughout the Pleistocene: From cell to populations to past marine hydrology, Chap. 8, in: Foraminifera: Classification, Biology, and Evolutionary Significance, edited by: Georgescu, M. D., Nova Science Publishers, New York, NY, 2013. Farmer, E. J., Chapman, M. R., and Andrews, J. E.: Holocene temperature evolution of the subpolar North Atlantic recorded in the Mg ∕ Ca ratios of surface and thermocline dwelling planktonic foraminifers, Global Planet. Change, 79, 234–243, 2011. Garcia, J., Mojtahid, M., Howa, H., Michel, E., Schiebel, R., Charbonnier, C., Anschutz, P., and Jorissen, F. J.: Benthic and planktic foraminifera as indicators of late glacial to Holocene paleoclimatic changes in a marginal environment: An example from the southeastern Bay of Biscay, Acta Protozool., 52, 163–182, 2013. Garcia-Soto, C. and Pingree, R. D.: Atlantic Multidecadal Oscillation (AMO) and sea surface temperature in the Bay of Biscay and adjacent regions, J. Mar. Biol. Assoc. UK, 92, 213–234, 2012. Garcia-Soto, C., Pingree, R. D., and Valdés, L.: Navidad development in the southern Bay of Biscay: Climate change and swoddy structure from remote sensing and in situ measurements, J. Geophys. Res., 107, https://doi.org/10.1029/2001JC001012, 2002. Gaudin, M., Mulder, T., Cirac, P., Berne, S., and Imbert, P.: Past and present sedimentation activity in the Capbreton Canyon, southern Bay of Biscay, Geo-Mar. Lett., 26, 331–345, 2006. Giraudeau, J., Jennings, A. E., and Andrews, J. T.: Timing and mechanisms of surface and intermediate water circulation changes in the Nordic Seas over the last 10,000 cal years: a view from the North Iceland shelf, Quaternary Sci. Rev., 23, 2127–2139, 2004. Giraudeau, J., Grelaud, M., Solignac, S., Andrews, J. T., Moros, M., and Jansen, E.: Millennial-scale variability in Atlantic water advection to the Nordic Seas derived from Holocene coccolith concentration records, Quaternary Sci. Rev., 29, 1276–1287, https://doi.org/10.1016/j.quascirev.2010.02.014, 2010. Guiot, J. and de Vernal, A.: Transfer functions: Methods for quantitative paleoceanography based on microfossils, in: Proxies in Late Cenozoic Paleoceanography, edited by: Hillaire-Marcel, C. and de Vernal, A., Amsterdam: Elsevier, 523–563, 2007. 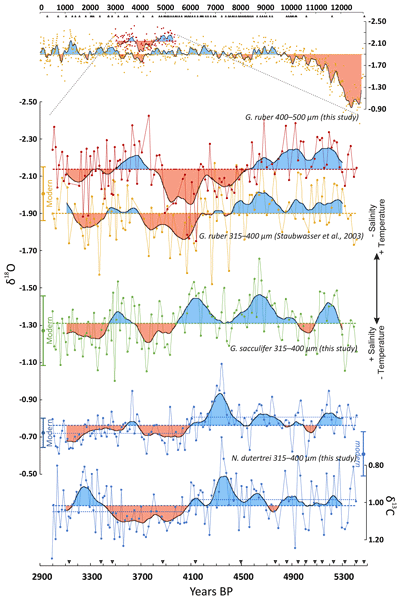 Guiot, J. and de Vernal, A.: Is spatial autocorrelation introducing biases in the apparent accuracy of paleoclimatic reconstructions?, Quaternary Sci. Rev., 30, 1965–1972, 2011. Hatun, H., Britt Sandø, A., Drange, H., Hansen, B., and Valdimarsson, H.: Influence of the Atlantic Subpolar Gyre on the Thermohaline Circulation, Science, 309, 1841–1844, 2005. Hayes, A., Kucera, M., Kallel, N., Sbaffi, L., and Rohling, E. J.: Glacial Mediterranean sea surface temperatures based on planktonic foraminiferal assemblages, Quaternary Sci. Rev., 24, 999–1016, 2005. Jackson, L. C., Kahana, R., Graham, T., Ringer, M. A., Woollings, T., Mecking, J. V., and Wood, R. A.: Global and European climate impacts of a slowdown of the AMOC in a high resolution GCM, Clim. Dynam., 45, 3299–3316, https://doi.org/10.1007/s00382-015-2540-2, 2015. Kennedy, J. J.: A review of uncertainty in in situ measurements and data sets of sea surface temperature, Rev. Geophys., 52, 1–32, https://doi.org/10.1002/2013RG000434, 2014. Koutsikopoulos, C., Beillois, P., Leroy, C., and Taillefer, F.: Temporal trends and spatial structures of the sea surface temperature in the Bay of Biscay, Oceanol. Acta, 21, 335–344, 1998. Kucera, M., Weinelt, M., Kiefer, T., Pflaumann, U., Hayes, A., Weinelt, M., Chen, M.-T., Mix, A.-C., Barrows, T. T., Cortijo, E., Duprat, J., Juggins, S., and Waelbroeck, C.: Reconstruction of sea-surface temperatures from assemblages of planktonic foraminifera: multi-technique approach based on geographically constrained calibration data sets and its application to glacial Atlantic and Pacific Oceans, Quaternary Sci. Rev., 24, 951–998, https://doi.org/10.1016/j.quascirev.2004.07.014, 2005. Landsea, C. W., Vecchi, G. A., Bengtsson, L., and Knutson, T. R.: Impact of Duration Thresholds on Atlantic Tropical Cyclone Counts*, J. Climate, 23, 2508–2519, 2010. Le Cann, B. and Serpette, A.: Intense warm and saline upper ocean inflow in the southern Bay of Biscay in autumn–winter 2006–2007, Cont. Shelf Res., 29, 1014–1025, https://doi.org/10.1016/j.csr.2008.11.015, 2009. Lherminier, P. and Thierry, V.: The Reykjanes Ridge Experiment, http://wwz.ifremer.fr (last access: 22 November 2016), 2015. Lozier, M. S.: Overturning in the North Atlantic, Annual Review of Marine Science, 4, 291–315, 2012. Lozier, M. S. and Stewart, N. M.: On the Temporally Varying Northward Penetration of Mediterranean Overflow Water and Eastward Penetration of Labrador Sea Water, J. Phys. Oceanogr., 38, 2097–2103, 2008. Lozier, M. S., Roussenov, V., Reed, M. S. C., and Williams, R. G.: Opposing decadal changes for the North Atlantic meridional overturning circulation, Nat. Geosci., 3, 728–734, 2010. Magny, M., Bégeot, C., Guiot, J., and Peyron, O.: Contrasting patterns of hydrological changes in Europe in response to Holocene climate cooling phases, Quaternary Sci. Rev., 22, 1589–1596, 2003. Mann, M. E., Zhang, Z., Rutherford, S., Bradley, R. S., Hughes, M. K., Shindell, D., Ammann, C. Faluvegi, G., and Ni, F.: Global signatures and dynamical origins of the Little Ice Age and Medieval Climate Anomaly, Science, 326, 1256–1260, 2009 (data available at: http://www.meteo.psu.edu/holocene/public_html/supplements/MultiproxySpatial09/, last access: July 2016). Marchal, O., Cacho, I., Stocker, T. F., Grimalt, J. O., Calvo, E., Martrat, B., Shackleton, N., Vautravers, M., Cortijo, E., and van Kreveld S.: Apparent long-term cooling of the sea surface in the northeast Atlantic and Mediterranean during the Holocene, Quaternary Sci. Rev., 21, 455–483, 2002. Martín-Chivelet, J., Muñoz-García, M. B., Edwards, R. L., Turrero, M. J., and Ortega, A. I.: Land surface temperature changes in Northern Iberia since 4000 yr BP, based on δ13C of speleothems, Global Planet. Change, 77, 1–12, 2011. Martrat, B., Grimalt, J. O., Shackleton, N. J., de Abreu, L., Hutterli, M. A., and Stocker, T. F.: Four Climate Cycles of Recurring Deep and Surface Water Destabilizations on the Iberian Margin, Science, 317, 502–507, 2007 (data available at: https://doi.org/10.1594/PANGAEA.771894). Mary, Y., Eynaud, F., Zaragosi, S., Malaizé, B., Cremer, M., and Schmidt, S.: High frequency environmental changes and deposition processes in a 2 kyr-long sedimentological record from the Cap-Breton canyon (Bay of Biscay), Holocene, 25, 348–365, https://doi.org/10.1177/0959683614558647, 2015. Mary, Y., Eynaud, F., Colin, C., Rossignol, L., Brocheray, S., Mojtahid, M., Garcia, J., Peral, M., Howa, H., Zaragosi, S., and Cremer, M.: Interactive comment on “Changes in Holocene meridional circulation and poleward Atlantic flow: the Bay of Biscay as a nodal point” by Yannick Mary et al., Clim. Past. Discuss., https://doi.org/10.5194/cp-2016-32-AC2, 2016. McCartney, M. S. and Mauritzen, C.: On the origin of the warm inflow to the Nordic Seas, Prog. Oceanogr., 51, 125–214, 2001. McGregor, H. V., Evans, M. N., Goosse, H., Leduc, G., Martrat, B., Addison, J. A., Mortyn, P. G., Oppo, D. W., Seidenkrantz, M.-S., Sicre, M.-A., Phipps, S. J., Selvaraj, K., Thirumalai, K., Filipsson, H. L., and Ersek, V.: Robust global ocean cooling trend for the pre-industrial Common Era, Nat. Geosci., 8, 671–677, https://doi.org/10.1038/ngeo2510, 2015. Mojtahid, M., Jorissen, F. J., Garcia, J., Schiebel, R., Michel, E., Eynaud, F., Gillet, H., Cremer, M., Diz Ferreiro, P., Siccha, M., and Howa, H.: High resolution Holocene record in the southeastern Bay of Biscay: Global versus regional climate signals, Palaeogeogr. Palaeocl., 377, 28–44, https://doi.org/10.1016/j.palaeo.2013.03.004, 2013. Morley, A., Rosenthal, Y., and deMenocal, P.: Ocean-atmosphere climate shift during the mid-to-late Holocene transition, Earth Planet. Sc. Lett., 388, 18–26, https://doi.org/10.1016/j.epsl.2013.11.039, 2014. Moros, M., Jansen, E., Oppo, D. W., Giraudeau, J., and Kuijpers, A.: Reconstruction of the late-Holocene changes in the Sub-Arctic Front position at the Reykjanes Ridge, north Atlantic, Holocene, 22, 877–868, 2012. Naughton, F., Bourillet, J. F., Sanchez Goni, M.-F., Turon J.-L., and Jouanneau J.-M.: Long-term and millennial-scale climate variability in northwestern France during the last 8850 years, Holocene, 17, 939–953, 2007a. Naughton, F., Sanchez Goñi, M. F., Desprat, S., Turon, J.-L., Duprat, J., Malaizé, B., Joli, C., Cortijo, E., Drago, T., and Freitas, M. C.: Present-day and past (last 25000 years) marine pollen signal off western Iberia, Mar. Micropaleontol., 62, 91–114, https://doi.org/10.1016/j.marmicro.2006.07.006, 2007b. Ollitrault, M. and Colin de Verdière, A.: The ocean general circulation near 1000 m depth, J. Phys. Oceanogr., 44, 384–409, 2014. Oppo, D. W., McManus, J. F., and Cullen, J. L.: Deepwater variability in the Holocene epoch, Nature, 422, 277–278, 2003. Peliz, Á., Dubert, J., Santos, A. M. P., Oliveira, P. B., and Le Cann, B.: Winter upper ocean circulation in the Western Iberian Basin – Fronts, Eddies and Poleward Flows: an overview, Deep-Sea Res. Pt. I, 52, 621–646, https://doi.org/10.1016/j.dsr.2004.11.005, 2005. Pena, L. D., Francés, G., Diz, P., Esparza, M., Grimalt, J. O., Nombela, M. A., and Alejo, I.: Climate fluctuations during the Holocene in NW Iberia: High and low latitude linkages, Cont. Shelf Res., 30, 1487–1496, https://doi.org/10.1016/j.csr.2010.05.009, 2010. Penaud, A., Eynaud, F., Sánchez-Goñi, M. F., Malaizé, B., Turon, J. L., and Rossignol, L.: Contrasting sea-surface responses between the western Mediterranean Sea and eastern subtropical latitudes of the North Atlantic during abrupt climatic events of MIS 3, Mar. Micropaleontol., 80, 1–17, 2011. Pérez-Brunius, P., Rossby, T., and Watts, D. R.: Absolute transports of mass and temperature for the North Atlantic Current-Subpolar Front system, J. Phys. Oceanogr., 34, 1870–1883, 2004. Pflaumann, U., Duprat, J., Pujol, C., and Labeyrie, L. D.: SIMMAX: A modern analog technique to deduce Atlantic sea surface temperatures from planktonic foraminifera is deep-sea sediments, Paleoceanography, 11, 15–35, 1996. Pingree, R.: North Atlantic and North Sea climate change: curl up, shut down, NAO and ocean colour, J. Mar. Biol. Assoc. UK, 85, 1301–1315, 2005. Pingree, R. D. and Garcia-Soto, C.: Plankton blooms, ocean circulation and the European slope current: Response to weather and climate in the Bay of Biscay and W English Channel (NE Atlantic), Deep-Sea Res. Pt. II, 106, 5–22, 2014. Pingree, R. D. and Le Cann, B.: Structure, strength and seasonality of the slope currents in the Bay of Biscay region, J. Mar. Biol. Assoc. UK, 70, 857–885, 1990. Planque, B., Beillois, P., Jégou, A.-M., Lazure, P., Petitgas, P., and Puillat, I.: Large-scale hydroclimatic variability in the Bay of Biscay: the 1990s in the context of interdecadal changes, in: ICES Marine Science Symposia, 219, 61–70, 2003. Reimer, P. J., Bard, E., Bayliss, A., Beck, J. W., Blackwell, P. G., Ramsey, C. B., Buck, C. E., Cheng, H., Edwards, R. L., Friedrich, M., Grootes, P. M., Guilderson, T. P., Haflidason, H., Hajdas, I., Hatté, C., Heaton, T. J., Hoffmann, D. L., Hogg, A. G., Hughen, K. A., Kaiser, K. F., Kromer, B., Manning, S. W., Niu, M., Reimer, R. W., Richards, D. A., Scott, E. M., Southon, J. R., Staff, R. A., Turney, C. S. M., and van der Plicht, J.: IntCal13 and Marine13 Radiocarbon Age Calibration Curves 0–50,000 Years cal BP, Radiocarbon, 55, 1869–1887, https://doi.org/10.2458/azu_js_rc.55.16947, 2013. Retailleau, S., Howa, H., Schiebel, R., Lombard, F., Eynaud, F., Schmidt, S., Jorissen, F., and Labeyrie, L.: Planktic foraminiferal production along an offshore-onshore transect in the south-eastern Bay of Biscay, Cont. Shelf Res., 29, 1123–1135, 2009. Retailleau, S., Eynaud, F., Mary, Y., Schiebel, R., and Howa, H.: An Ocean – Canyon head and river plume: how they may influence neritic planktonic foraminifera communities in the SE Bay of Biscay?, J. Foramin. Res., 42, 257–269, 2012. Risebrobakken, B., Dokken, T., Smedsrud, L. H., Andersson, C., Jansen, E., Moros, M., and Ivanova, E. V.: Early Holocene temperature variability in the Nordic Seas: The role of oceanic heat advection versus changes in orbital forcing, Paleoceanography, 26, PA4206, https://doi.org/10.1029/2011PA002117, 2011. Rodrigues, T., Grimalt, J. O., Abrantes, F. G., Flores, J. A., and Lebreiro, S. M.: Holocene interdependences of changes in sea surface temperature, productivity, and fluvial inputs in the Iberian continental shelf (Tagus mud patch), Geochem. Geophy. Geosys., 10, Q07U06, https://doi.org/10.1029/2008GC002367, 2009 (data available at: https://doi.org/10.1594/PANGAEA.761812). Roth, R. and Joos, F.: A reconstruction of radiocarbon production and total solar irradiance from the Holocene 14C and CO2 records: implications of data and model uncertainties, Clim. Past, 9, 1879–1909, https://doi.org/10.5194/cp-9-1879-2013, 2013. Salgueiro, E., Voelker, A., Abrantes, F., Meggers, H., Pflaumann, U., Loncaric, N., Gonzalez-Ãlvarez, R., Oliveira, P., Bartels-Jónsdóttir, H. B., Moreno, J., and Wefer, G.: Planktonic foraminifera from modern sediments reflect upwelling patterns off Iberia: Insights from a regional transfer function, Mar. Micropaleontol., 66, 135–164, 2008. Salgueiro, E., Voelker, A. H. L., de Abreu, L., Abrantes, F., Meggers, H., and Wefer, G.: Temperature and productivity changes off the western Iberian margin during the last 150 Â ky, Quaternary Sci. Rev., 29, 680–695, 2010. Sánchez Goñi, M. F., Bakker, P., Desprat, S., Carlson, A. E., Van Meerbeeck, C. J., Peyron, O., Naughton, F., Fletcher, W. J., Eynaud, F., Rossignol, L., and Renssen, H.: European climate optimum and enhanced Greenland melt during the Last Interglacial, Geology, 40, 627–630, 2012. 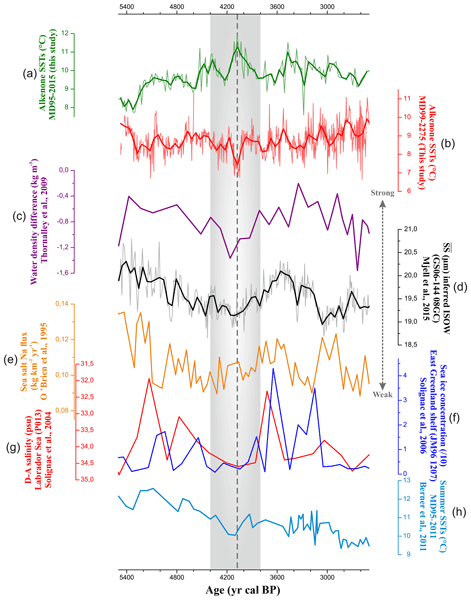 Sánchez Goñi, M. F., Bard, E., Landais, A., Rossignol, L., and d'Errico, F.: Air–sea temperature decoupling in western Europe during the last interglacial–glacial transition, Nat. Geosci., 6, 837–841, https://doi.org/10.1038/ngeo1924, 2013. Sarnthein, M., Van Kreveld, S., Erlenkeuser, H., Grootes, P. M., Kucera, M., Pflaumann, U., and Schulz, M.: Centennial-to-millennial-scale periodicities of Holocene climate and sediment injections off the western Barents shelf, 75° N, Boreas, 32, 447–461, 2003. Schäfer-Neth, C. and Manschke, A.: WOA-Sample tool, http://www.geo.uni-bremen.de/geomod/staff/csn/woasample.html (last access: January 2016), 2002. Solignac, S., Grelaud, M., de Vernal, A., Giraudeau, J., Moros, M., McCave, N., and Hoogakker, B.: Reorganization of the upper ocean circulation in the mid-Holocene in the Northeastern Atlantic, Can. J. Earth Sci., 45, 1417–1433, 2008. Sorrel, P., Tessier, B., Demory, F., Delsinne, N., and Mouazé, D.: Evidence for millennial-scale climatic events in the sedimentary infilling of a macrotidal estuarine system, Quaternary Sci. Rev., 28, 499–516, 2009. Sorrel, P., Debret, M., Billeaud, I., Jaccard, S. L., McManus, J. F., and Tessier, B.: Persistent non-solar forcing of Holocene storm dynamics in coastal sedimentary archives, Nat. Geosci., 12, 892–896, https://doi.org/10.1038/ngeo1619, 2012. Staines-Urías, F., Kuijpers, A., and Korte, C.: Evolution of subpolar North Atlantic surface circulation since the early Holocene inferred from planktic foraminifera faunal and stable isotope records, Quaternary Sci. Rev., 76, 66–81, 2013. Tanner, B. R., Lane, C. S., Martin, E. M., Young, R., and Collins, B.: Sedimentary proxy evidence of a mid-Holocene hypsithermal event in the location of a current warming hole, North Carolina, USA, Quaternary Res., 83, 315–323, https://doi.org/10.1016/j.yqres.2014.11.004, 2015. Telford, R. J. and Birks, H. J. B.: Effect of uneven sampling along an environmental gradient on transfer-function performance, J. Paleolimnol., 46, 99–106, 2011. Telford, R. J., Li, C., and Kucera, M.: Mismatch between the depth habitat of planktonic foraminifera and the calibration depth of SST transfer functions may bias reconstructions, Clim. Past, 9, 859–870, https://doi.org/10.5194/cp-9-859-2013, 2013. Thornalley, D. J. R., Elderfield, H., and McCave, I. N.: Holocene oscillations in temperature and salinity of the surface subpolar North Atlantic, Nature, 457, 711–714, 2009. Trouet, V., Scourse, J. D., and Raible, C. C.: North Atlantic storminess and Atlantic Meridional Overturning Circulation during the last Millennium: Reconciling contradictory proxy records of NAO variability, Global Planet. Change, 84–85, 48–55, 2012. Valencia, V., Borja, Å., Fontån, A., Pérez, F. F., and Rios, A. F.: Temperature and salinity fluctuations along the Basque Coast (southeastern Bay of Biscay), from 1986 to 2000, related to climatic factors, ICES J. Mar. Sci., 219, 340–342, 2003. Van Vliet-Lanoe, B., Goslin, J., Hallegouet, B., Henaff, A., Delacourt, C., Fernane, A., Franzetti, M., Le Cornec, E., Le Roy, P., and Penaud, A.: Middle- to late-Holocene storminess in Brittany (NW France): Part I – morphological impact and stratigraphical record, Holocene, 24, 413–433, https://doi.org/10.1177/0959683613519687, 2014a. Van Vliet-Lanoe, B., Penaud, A., Henaff, A., Delacourt, C., Fernane, A., Goslin, J., Hallegouet, B., and Le Cornec, E.: Middle- to late-Holocene storminess in Brittany (NW France): Part II – The chronology of events and climate forcing, Holocene, 24, 434–453, https://doi.org/10.1177/0959683613519688, 2014b. Voelker, A. H. L. and de Abreu, L.: A Review of Abrupt Climate Change Events in the Northeastern Atlantic Ocean (Iberian Margin): Latitudinal, Longitudinal, and Vertical Gradients, in: Geophysical Monograph Series, edited by: Rashid, H., Polyak, L., and Mosley-Thompson, E., American Geophysical Union, Washington, D.C., 15–37, 2011. Walker, M. J. C., Berkelhammer, M., Björck, S., Cwynar, L. C., Fisher, D. A., Long, A. J., Lowe, J. J., Newnham, R. M., Rasmussen S. O., and Weiss, H.: Formal subdivision of the Holocene Series/Epoch: a Discussion Paper by a Working Group of INTIMATE (Integration of ice-core, marine and terrestrial records) and the Subcommission on Quaternary Stratigraphy (International Commission on Stratigraphy), J. Quaternary Sci., 27, 649–659, 2012. Wanner, H., Beer, J., Bütikofer, J., Crowley, T. J., Cubasch, U., Flückiger, J., Goosse, H., Grosjean, M., Joos, F., Kaplan, J. O., Küttel, M., Müller, S. A., Prentice, I. C., Solomina, O., Stocker, T. F., Tarasov, P., Wagner, M., and Widmann, M.: Mid- to Late Holocene climate change: an overview, Quaternary Sci. Rev., 27, 1791–1828, https://doi.org/10.1016/j.quascirev.2008.06.013, 2008. Werner, K., Spielhagen, R. F., Bauch, D., Hass, H. C., and Kandiano, E. S.: Atlantic Water advection versus sea-ice advances in the eastern Fram Strait during the last 9 ka: Multiproxy evidence for a two-phase Holocene, Paleoceanography, 28, 283–295, 2013 (data available at: https://doi.org/10.1594/PANGAEA.810415). In the boreal Atlantic, the subpolar and subtropical gyres (SPG and STG respectively) are key elements of the Atlantic Meridional Overturning Circulation (AMOC) cell and contribute to climate modulations over Europe. Here we document the last 10 kyr evolution of sea-surface temperatures over the North Atlantic with a focus on new data obtained from an exceptional sedimentary archive retrieved the southern Bay of Biscay, enabling the study of Holocene archives at (infra)centennial scales.